I came to love fantasy fiction the same way I believe young people first become exposed to it today – through visual media. Although I’ve always been an avid reader, I was not always a big fan of fantasy as a written genre. Growing up I devoured books that were mostly contemporary in nature. It’s almost funny to think back on all those Sweet Valley High books I horded from the library. But as I matured, so did my taste for fiction. I read the Goosebumps series, which perked my interest in paranormal and horror. And eventually I stretched to loving anything and everything by Lois Duncan. Still, none of this interest stretched to fantasy. At least not in books. Television and movies were a different story entirely. I gravitated toward all things fantasy without even realizing it. My favorite Disney movies were The Little Mermaid and Beauty and the Beast (both of which were originally written fairytales). My favorite television cartoon show was the Japanese anime Sailor Moon (which used the Greek myths of Selene and Endymion along with a teen comes of age theme). And my favorite movie of all time is still Labyrinth, which is a fantastic quest story with traditional fantasy characters. During my freshman year of high school, I picked up one of my mother’s romance novels and became enthralled by the time travel/fantasy aspect that led the plot. After that, I was a goner. I could hardly read a book unless it had some fantastical element to it. Contemporary stories seemed so pale in comparison to magic, dark lords, epic quests, and everlasting love. Even now, in my adult years, I find that I gravitate toward the hopeful, energetic fantasy of young adult literature. Something about it still feels fresh, new, and exciting – as though it were possible to remain 16 forever, to capture that youthful essence and innocence and awe of life in a bottle and access it just by reading words on a page. It’s why I started writing fiction to begin with. I can only hope that I’m capable of translating that feeling to my tales because the feeling itself is nearly as magical as the worlds that create it. 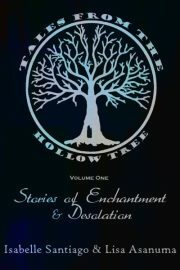 And now, with Hollow Tree serving as a place to post small secrets, little tidbits of imaginary lives, Lisa and I hope to take you on the magic journey with us. We hope you’ll stay along for the ride. I think you could probably stay 16 forever if you tried hard enough : ) Thanks for the energy you’ve put into these pages! Hi, I was just wondering if you could point me in the right direction for some research on the Oberon and Titania mythology that I would need for my novel. Wikipedia is often a wonderful research for specific character information, but the library will have much more extensive information on the mythology and could provide you their stories in the Shakespearean play! Wishing you much success!